Xidax Review, Should You Just Build Your Own PC Rig? I’d like to review over Xidax for their “ultimate” custom gaming PCs. Most pre-built sites like this don’t really have good value, but we’ll see if Xidax does! I’ll be looking into different budget points for custom PCs that they have, if the parts are of quality measure and if it’s actually worth getting for the price. CyberpowerPC Gamer Ultra GUA880 Review, Does It Live Up To Today’s Standards? It’s time for a CyberpowerPC Gamer Ultra GUA880 review for many don’t think it is of good enough value for the price. I’ll do the hard work for you. I’d like to analyze the actual hardware included with this desktop, really to dive deep into it to really see what it’s capable of. Just like most pre-built gaming computers, the video card isn’t at all ready for today’s standard of gaming – mainly for the AAA titles which is the type of games most people really want to play. Most people nowadays also have at least a 1080p resolution display that they want to game with. With this desktop as is, 1080p would be doable but only for small indie titles. You’d have to play on 720p and probably even lower if you’re wanting to play the newer games on lowest settings. 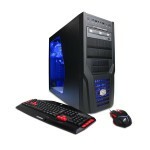 Are you looking at a pre built gaming PC that is relatively cheap, one that is looking nice? You need to understand what’s really under the hood with these PCs. There are so many computer companies out there that try to boast how awesome their hardware is and how great it looks when the reality is that almost the exact opposite is true. I’ve reviewed a few pre built gaming PCs lately and there is a trend of there being crappy hardware inside that doesn’t match the actual power and value that is to be expected when the PC arrives at your doorstep. Even most of the sites that give you a guide to build your own PC that they build for you don’t give you the most power per dollar spent. I think that it is time to review the CybertronPC Patriot GM1293D desktop simply because it is still a pretty popular gaming PC for those in the market for one. Like most of the other pre-built PCs out there, this PC is just not fit for today’s and tomorrow’s standard for PC games. The video card is a Radeon HD 7480D which is graphics embedded into the CPU. Yeah, you’re going to need an actual video card if you’re planning on playing any AAA titles at all. The CPU is a AMD A4-5300 3.40GHz Dual-Core processor which is pretty iffy on the performance side of things… you could do way better building your own PC for around the same price point. 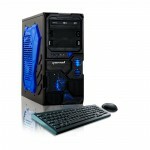 Alright, today I’m writing a CybertronPC Hellion GM1213B gaming PC review. This PC has some unique features that actually might make it worthy of a purchase. Although, as always, building your own PC would prove to cost a lot less, this specific PC comes with some features that are hard to ignore. It’s time to review the CybertronPC Borg-Q GM4213A desktop PC because it’s a sort of “trendy” PC for people looking to get into PC gaming but there isn’t much value given per dollar spent.